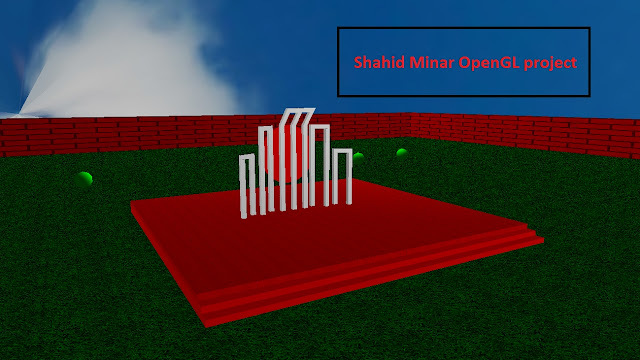 A Very Good 3D Project on Martyr’s Monument (Shaheed Minar) Submitted by Nayeem. It is a 3D Computer Graphics OpenGL projects based on Bangladesh Shaheed Minar or Martyr’s Monument. Note : - This Projects is submitted by Nayeem through the Submit Your Project which you can too submit as well. Martyr’s Monument (Shaheed Minar) is based at Dhaka, it was projects idea of teacher of Nayeem from Ahsanullah University of Science and Technology Dept. of Computer Science and Engineering. It is wonderful projects based on the ideal martyrs monuments. It is also a tribute for martyrs and to remember them by laying down flowers to the Martyr’s Monument. The project showcase the Shaheed Minar Structure of Dhaka with the perfect scale. The structure was design this architecture with perfection with compute graphics using opengl. Different texture like grass, sky and tiles used in this program to give more realistic look. There are two mode in the project which show the structure in Day and Night Lighting combination. There is an option to rotate Shahid Minar at 360o. It also have text display in 3D. The main Challenge in completing the project was to find the right coordinate to draw plane for object surface. It was really very challenging finding original coordinate display it perfectly. Add City View and flower dropping on base. Add many peoples around the structure who pay homage by flowers etc. Add boundary and other stuffs. Add more animation to the project. Add sound and music to the project. You can download the source code of the project from Github as well as report from there.